This week in Nerdvana… When the nerds return home after the Nerd Off, Colby places Ori’s horcrux upon the alter with the others and the Ori glory commences. Ori is a great guy and Amanda thinks he had a good experience in Nerdvana; she will also be taking up Larping when she gets home as a form of exercise. While it’s great that Colby is still around because he makes Team SMASH stronger, Amanda knows he is a threat to her becoming King of the Nerds and he needs to be eliminated. 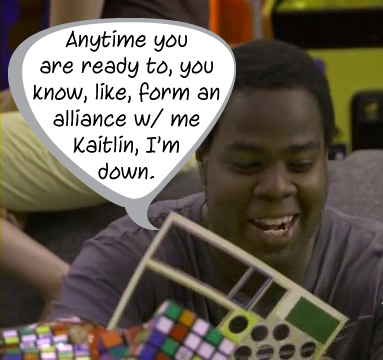 Ori glory ceases when Kaitlin suggest they have dinner then play board games; Colby says he’ll set up Puerto Rico. Colby sees winning as a double-edged sword: he’s still in the game, but since he won a Nerd Off he’s now an even bigger threat. Now he’s going to be targeted by eeeverybody and if they are going to take a shot at the king, they better not miss! The next morning in the House Hooloovoo bedroom, there is a lot of pony talk. Raychelle thinks that if the day’s Nerd War is about ponies they’ve got in the bag. Kaitlin thinks ponies are devious little creatures, not the My Little Ponies, but the real ones; Raychelle urges her to watch the show. Calling all Nerds! 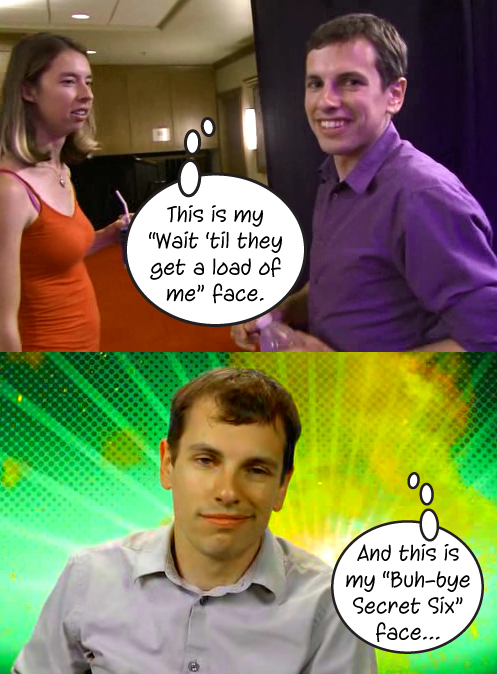 It’s time for the Nerd War and it is business time; Curtis and Bobby are all professional-like in suits and ties. After the Nerds have assembled they explain that before electricity there were cave nerds and they gamed unplugged. As a giant box is being delivered, Curtis says that this week they will take them back to those cave nerd days. What’s in the box? WHAT’S IN THE BOX?! (lol, Colby! I didn’t even hear you say it like that in the show until I watched it again!) Bobby says that he’s ordered some famous nerds to help out in this week’s Nerd War, which will be a battle royale of nerdy party games. Lily has no idea what a “nerdy party game” is; when she thinks of “nerdy party games” she thinks of Settlers of Catan, (it’s a board game). Each team will have a celebrity nerd on their team, (Heather is hoping for Wil Wheaton), but they don’t get to know who they are just yet! Curtis urges them to study hard and releases them from the courtyard. Time for the Nerd War! In the living room, the nerds assemble; Curtis, Bobby and two boxes containing the celebrity nerds are situated in front of two couches. After taking their seats, Curtis welcomes then it’s time to dish out the contents of the boxes. Colby is hoping that one of the celebrity nerds is NOT Moby or there will a fight. (lol) House Hooloovoo gets to choose their box first and they go with the box on the right, because, as Raychelle explains, it’s the right box. Inside is Penn Jillette (Penn and Teller…)! Team SMASH, of course, will get the help of the celebrity in the box on the left and it is Rachelle Lefevre (Twilight, Under the Dome)! Cool celebs! And NOT Moby, (but not Wil Wheaton…). Raychelle is super excited about Penn being on her team; he’s loud and crazy and she’s hoping he’ll rattle Team SMASH during the competition, but Rachelle is quite a spitfire herself. 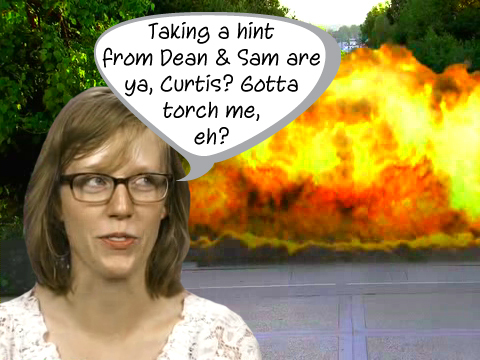 After a little banter between teams, Curtis finally gets to explain the Nerd War. There will be three rounds. In Round One they will play a game called “Name That Nerd”. Each team will have a captain, (Ben for Hooloovoo and Colby for SMASH), and that person must guess the name of a famous nerd from a series of one word clues given by the rest of the team; each team has two minutes to name as many nerds as they can and gets ten points per correct answer. The Round Two game is called “Pic-So-Nerdy”. Taking turns in thirty second intervals, each team will have three minutes to name as many nerdy objects as possible based on the pictures drawn by their team mates. They will earn twenty points this round for each correct answers. And finally the Round Three game is called “Panto-Nerd”. It’s charades. The theme is nerdy TV and movies, they have two minutes and each correct answer is worth thirty points. 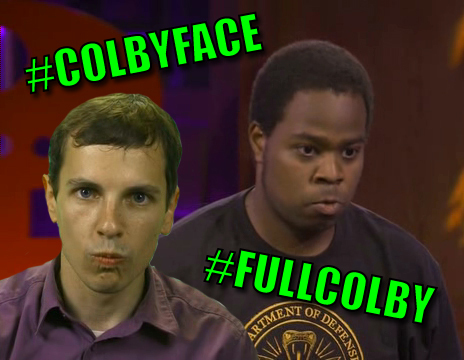 After the first round, the teams are tied at 140 points and Team SMASH has finally caught onto my discovery of “Colby Face”! Because Colby is INTENSE in his turn of “Name That Nerd”. Jonathan’s impression is pretty good! In the second round, we learn that Colby is not the best artist in Nerdvana and that Lily was right when she said that all of Hooloovoo had the ability to rock this game. Hooloovoo takes the lead with 300 points to Team SMASH’s 280. Round three commences and Team SMASH boosts their score to 490. And lol, Heather! Nice attempt with The Neverending Story, even if Amanda didn’t understand you were referencing her “loin product”, (because her son’s name is Atreyu), it was a very nice attempt. So it all comes down to House Hooloovoo and it’s as if time slows down for everyone. No one knows how much time is left and everyone is counting the number of right answers; they only need seven. It finally comes down to one title. My. Little. Pony. Kaitlin, (and Raychelle), guesses the correct answer and Hooloovoo wins this Nerd War with a score of 510 points. They ALSO win an ultimate table top pack from Rio Grande Games! So Team SMASH has lost their second Nerd War in a row. Ben says it’s time they feel what that is like since Hooloovoo has experienced the same thing in the game. Jonathan knows that people’s true loyalties are about to be illuminated since a member of the Secret Six is going to be put into the Nerd Off. While Hooloovoo celebrates their victory in their bedroom, Team SMASH is getting emotional in theirs. 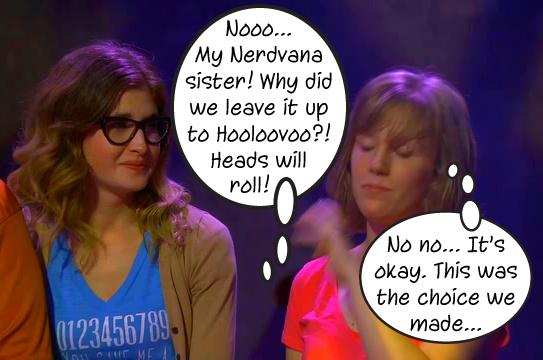 Amanda doesn’t want to vote anyone into the Nerd Off and Heather knows that if Hooloovoo votes for Colby she’ll have to choose between Amanda and Jonathan and she just can’t. That night at dinner, the green machine asks if they can just not talk about the impending vote. To change the subject, Lily asks if they are going to do improvisational Star Wars that night. No, everyone agrees and then Ben says they will do what all families do. They will repress their feelings and enjoy a nice, lukewarm mean together. It would be a funnier comment if everyone didn’t look so sad. After awkward dinner, Heather, Raychelle, Amanda, Lily and Jonathan find themselves alone around the table. Amanda announces that SMASH would like to vote Colby into the Nerd Off and leave the choice of his competitor in the hands of Hooloovoo. Heather and Amanda just don’t want to betray each other and Jonathan thinks it’s not a very good strategy. Alone with Lily, Jonathan confirms the plan with her and she asks him who he think can beat Colby. Jonathan thinks that Colby is going to win no matter which nerd he’s up against. Lily asks Heather; she says Jonathan could beat Colby. With Ben present, Amanda also says that Jonathan has a good shot at beating Colby in the Nerd Off and Ben agrees. Amanda says make it happen. Later, Raychelle is sitting in the living room alone with Jonathan and says that she will not vote for him, she’ll never vote for him, but everyone else is leaning towards doing just that. *Snap* Secret Six Self-Destruction sequence activated. Jonathan approaches Kaitlin and pulls her into the Team SMASH bedroom for a chat. He reveals the Secret Six alliance to her, informs her that Amanda and Heather sold him out to Ben and Lily and then he explains his idea. If they work together with Raychelle and Colby the numbers are even and their foursome will have just as much power as the Ben/Lily/Heather/Amanda foursome. Kaitlin agrees and the Secret Six is history. To the Nerd Off! As they nerds enter the dystopian wasteland of the future they see that Curtis, dressed in normal clothes (because he “didn’t get the memo”, and Bobby, dressed as Lord Humongous from the Mad Max series are waiting for them. After lifting his mask, Bobby explains that within the vats of toxic sludge are the last remnants of the last game on Earth then he and Curtis reveal the game board. It’s a word jumble and they must find the twenty-eight letters that are hidden in the vats to solve the message then use the letters that are contained in red boxes to unscramble the a question with a connection to the message. If a player answers incorrectly they will incur a thirty second penalty. GO! Heather and Colby plunge into the vats and start pulling out all sorts of fun props and both toss props to one side and letter tiles to another. After about ten letters, Colby starts inspecting the message and forming words. Heather is still scrounging for letters and finally just decides to dive right in, literally; she climbs into one of the vats to search for more tiles while Colby is starting to place his on the puzzle board. Aaand I missed the scenes for next week sooo I have no idea what to expect and I’m fine with that. The “next time on” sequence always gives away who loses the Nerd Wars for me so I’m fine being in the dark. I am very curious to see how Kaitlin and Raychelle swayed Ben and Lily to voting for Heather instead of Jonathan. I want to know what cards they put on that table for sure. Hopefully we find out next week! 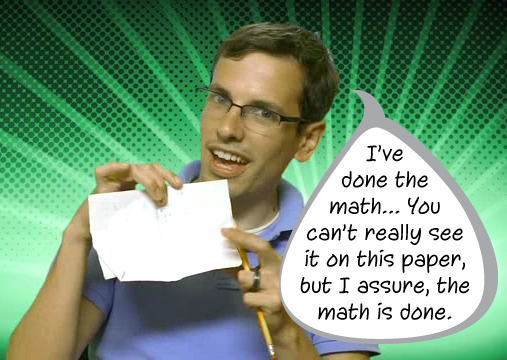 Until then… King of the Nerds airs on TBS on Friday nights at 9/8c and check out Knights of Nerdvana! 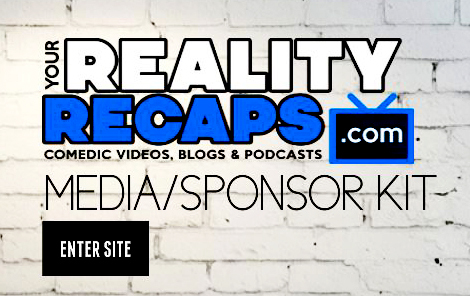 There is also lots of other content here at Your Reality Recaps for you reality TV nerds like me. We’ve got plenty of Bachelor coverage from Dana, blogs & recap videos, Bravo shows and check out my Survivor: Worlds Apart Cast Preview before the premiere on CBS, Wednesday, February 25th! Also… check out On the Block with my friends Spencer & McCrae from Big Brother with their special guest: ORI!